Engage in Raising a Baptist Interest, and Securing the Building Lot, at Hornellsville, Steuben County—Health Fails—Removal to Southport, Chemung County, with the New Church and Church Edifice—Death of Mrs. Sheardown—The Parsonage Secured by Deacons Howell and Brown—Second Marriage—Removal to Troy, Bradford County, Pennsylvania—Varied Thoughts—Conclusion. This appeared to be one of the most thriving villages on that part of the line, being the terminus of the western section, and the point of junction with the railway to Buffalo. There was a large, floating population. I found people dwelling in partly finished habitations, in shanties, and, in some instances, large barns had been partitioned off for the accommodation of families. Everything looked like thrift and activity. I found in the village a brother and sister Owen, with whom I had been acquainted when they were young people. He was converted in Elmira. His wife I had baptized into the fellowship of the church in Reading, in her early years. They were well posted in relation to the field for labor. There was no Baptist church in the place, and not to exceed half a dozen Baptists. We engaged a hall on Main street for a place of worship. It was well located, but in some respects was not a desirable place—for, like all public halls, in such villages, it was used through the week for all kinds of performances. Sometimes, when I went to attend worship on Sabbath morning, I would find theatrical apparatus, curtains, and paintings, as they had been left on Saturday night. But we kept on laboring, and things began to look favorable. The Hornellsville church was organized, October 15, 1852, with fourteen members, and attended all the ordinances of God’s house as best they could. I had been in the village but a short time before I began to look about for some vacant lots suitable for a meeting house. There was a corner, at Church and Canisteo streets, which appeared to me the most desirable location, for the purpose, in all the place. If my memory serves me, the lot is about eight rods on one street, and twelve on the other. Upon inquiry, I could not at first find any one who knew who owned it. One day, I stopped a gentleman on the street to chat a moment or two with him, and said, "Sir, can you tell me who owns this corner?" He said he thought the lots were not owned by any person in the village. They had been held by some gentlemen who had been speculating in land and building houses for sale, but they had closed their business, and where they had gone he did not know—"but if any one can give you the information, probably Esquire L. can." I waited upon Esquire L., who informed that the owners resided in New Hampshire. After gaining what information I could, I asked him if he would do me a kindness. He was not, strictly speaking, a religious man, and (I was told) held views, on the subject of future punishment, directly opposite my own. But that made no difference to me as far as my business with him was concerned. I remarked, "Now, sir, I expect you will stand fire—that is, I want to talk with you, confidentially—do not want my conversation to come out upon the street. I desire you to write to these gentlemen—inasmuch as you have business transactions with them—and please to inquire if these lots are for sale, and, if so, what will be the price of them?" One of the owners wrote that the lots were for sale, but he had not power to sell them, as his partner was at the West, transacting business—he thought the price would probably be six hundred dollars. He gave us his partner’s address, for any further information. I requested Esquire L. to write to the gentleman, West. We received no answer—waited some time—wrote again to New Hampshire—learned that the Western partner had changed his location, and then addressed him at his new residence. He promptly replied that the lots were for sale, but should not name the price, as he expected to be in Hornellsville, soon, and would dispose of them in person. The thing we most feared, now threatened us—if he should offer them for sale, there were certain land speculators who in all probability would give more than we could be able to offer. A few days after this information, another letter was received, saying he had declined coming east, and the lots could be had for six hundred. I immediately said to my legal friend, "Now, sir, will you please write again to the gentleman in New Hampshire, giving him what information you have had from his partner, or enclose his letter that he may see for himself—asking him to appoint you his agent to manage this business? The lot I want to build a church upon, and that is the reason why I did not wish this correspondence to be made public." He replied, "I should have no objection to do this, providing you were calculating to purchase the property for yourself; but your church, sir, is too small, and too poor either to buy lots or build a house." I replied to him, "The few Baptists in this village, with all the reproach that is heaped upon them, are not the representatives of the Baptist denomination in the State of New York. If we have not the money, there are those who have." The reply was, "They may have the money, but can you obtain it?" I said to him, "Sir, how long will you give us to settle this point relative to the means?" He replied, "If I have got anything more to do about this, I should like to do the business up pretty soon." "Well, sir, in twenty-four hours, I will set your mind at rest." I knew who had the money. I consequently got into the cars, came down to Elmira, called upon the pastor of the Baptist church, and made known my errand. I told him we wanted six hundred dollars, and that six hundred dollars we must have. The property was well worth the money for any individual to take, even on speculation. He said, "Where is your mind made up to make a call?" I told him, in the first place, we would call on Brother Riggs Watrous. He was a business man, and I endeavored to present the thing to him in a business point of view. He said at once, "I will take an equal share of the six hundred dollars, in one hundred dollar shares, providing Deacon Howell, Brother Grover, Brother Canfield," and one other whose name has escaped my mind, "will do the same." I obtained the four for one hundred dollars each, and Brother Watrous, if my memory serves me, was the advance two hundred dollars to make the thing complete. Brother W. inquired, "Now, when do you want this money?" "Not until Mr. L. gets the deed." "It will have to be acknowledged in New Hampshire and in Wisconsin, which will take some time to get around. If my figures tell truly, it will be along about the first week in January." I said to Bro. Watrous, "Now, we want something to show that this is a bona fide contract—that you are holden for six hundred dollars when the papers shall be presented." He remarked, "I will straighten up all that. I will give you a line to Mr. ____, one of the most wealthy merchants in your village, who is doing a large business with me, and he will satisfy Mr. L. that all is right in this thing." I arranged the business, and my friend L. appeared to be very happy that we had got things in such a safe train. He said, "I have been to see Mr. _____, and he informs me that the paper is just as good as any Bank in the State." We called a council, to see if they would fellowship the little church, early in January. They arrived overnight, and among them were some of those dear friends who had agreed to advance the funds. Brother Watrous had put the money in his pocket, when he started for the council, and, I think, in the morning’s mail, the papers arrived. The next day the money was paid over, and all was right. Next, we wished those brethren to give the little church, through their trustees an article to run five years. So far, we had secured some foothold in that village. If we had no credit there, it was a clear case that brethren abroad had confidence in us. My health failed me after I had been there about fifteen months, and I was under the necessity of retiring from the field, thinking my earthly work was done. There was but one sermon more that I thought I should ever preach, and perhaps not that. I was under pledge to preach a dedication sermon, for what was called a Mission church, between five and six miles south from Elmira, to be known as the Pine Woods Church, but which eventually took the name of SOUTHPORT. The church in Hornellsville felt very severely the necessity which rested upon their first pastor to resign his charge. But his successor went on to build the house. It is a beautiful, brick structure, an honor to the village, to the pastor, and to the people who accomplished the work. I believe it cost something over four thousand dollars. Embarrassed with their land debt, and something for building, it kept them (as it is often termed) "under the harrow." But the ladies were most indomitable in perseverance, and have done their part, and sometimes I thought more than their part, towards liquidating their debts and making the internal part of the house desirable. The Chemung River Association, as they have always done, were ever ready to aid in whatever way they could. The church had unnecessary trouble, and caused their friends much anxiety, in consequence of their own somewhat divided state, when Satan got the advantage of them. But I believe they are now clear of debt, (much of it having been paid by the Elmira brethren)—are in comfortable union—and happy under the labors of Brother Seely. Although they have had many trials, they have also much to encourage them—a young minister strong to labor, a fine field, and as I was informed last evening, their village contains four thousand inhabitants. There is, I believe, no Baptist church within five or more miles; consequently, they have a large margin on the outside of their border. My heart would rejoice could I see them again in the flesh, all walking together in the bonds of unity and peace. I feel sad to-day, just having received the tidings that Rev. S. M. Bainbridge, pastor of the Central church in Elmira, has suddenly paid the debt of nature, and gone to his rest. I had known him from his College days, and was acquainted with his family and with his wife’s family before they were married. It has brought my mind back to the changes which have taken place in the Baptist interest in that young city. The First Baptist church was organized in 1829. The place was originally called "New Town," and I had heard much of it under that old name. When I first saw it, I found that, as is often the case, we judge of the magnitude of a thing by the accounts we hear of it, but are disappointed when it is presented to our vision. More than forty years ago, when first visiting the place, I was like the boy who was looking all around for the Fourth of July, when in reality he was in the midst of it! My thoughts revert to the days of Bro. Philander D. Gillette, whose remains, with those of his brother, Daniel H., have for years been slumbering in the ground. We often conversed in relation to the Baptist interest in Elmira, and often knelt together and prayed that God might bless and prosper that little, infant band. I had often said to brethren in the First church, "Now is your time to colonize; the little one has in a measure become a thousand; you have wealth enough, numbers enough that you might spare, and territory on which they might pitch their tent—and in a few years, under God, they might stand up by your side like an only son, full of life and vigor, by the side of his father, while his father’s locks began to tinge with gray, his countenance furrowed with the cares of human life." I feared, if they do not make the sacrifice, and do what appeared to be God’s will and their duty, the day might come when some unexpected whirlwind might pass over them and leave them in a very unhappy condition. I am sorry that my fears have been too much realized. There are few if any among the churches more endeared to me than the First Baptist church in Elmira. There are also dear brethren and sisters, in the Central church, whom I love in the Lord. I hope the time is not far distant when these two churches may enjoy all the good feeling, love, and harmony that it is their privilege to enjoy as the redeemed people of the Prince of Peace. I have said that I felt sad, to-day. And something more. I feel like a reed shaken with the wind. With me, "the grasshopper is a burden, and desire fails." I am realizing very sensibly, my mortality. Had it not been for the love and deference I owe to my brethren of the Chemung River Association, I could never have made up my mind to comply with their request to give them these few dottings of my checkered life. I feel at times as if haunted by a specter, that, after having done and said all I have to do and say on this subject, my friends, will feel towards it as a certain old man said relative to himself. After hardly ever seeing a school for sixty years, he supposed, while almost in his second childhood, that he was well qualified to teach. I saw him pass my door in the morning, and said to him, "Where now? "—"Going," he replied, "before the school inspectors to be examined." On his return, I inquired, "Well, how have you come out? "—"I have been run through the mill," he replied, "and have come out—all bran!" In the judgment of charity, I think the brethren may say of me, as the old man said of himself. My nervous system is taxed to its utmost capacity while this work is progressing, and I sometimes feel afraid that it will fall into perfect wreck and ruin before I shall get to the close—the end—which is near at hand. Having resigned my charge, through indisposition, at Hornellsville, in the spring of 1854, I sought again to enjoy the sweets of HOME, and rest in the bosom of my family. I had left my companion in Havana, (three miles south from Jefferson,) with my second son, Dr. S. B. Sheardown. She had become infirm, and afflicted with paralysis—and my son felt desirous of having her continually under his own eye. When called to leave Hornellsville and the dear brethren I loved so much, and where I had anticipated bringing them through the building of their house, I had about made up my mind to spend the remnant of my days, as much as possible, free from the labors and cares through which I had so long toiled and traveled. But God thought otherwise. I received notice from Bro. Chandler, then pastor of the First church in Elmira, that the house of worship for their Mission church was about finished, the day set for the dedication service, and they still depended upon me to preach the sermon. The building of that house was a good work. It is a neat superstructure, situated in a pleasant place. The whole cost I do not now recollect, but it certainly could not have been less than twenty-five hundred dollars, calculating the grubbing, for it was built in the woods. The grading and fencing, together with the edifice, must have amounted to the sum specified, beside the building of a row of sheds for the accommodation of horses and carriages. Three of the brethren of the First church, living in that region, lifted very heavy. I think I never saw men of their means do better than they. They must have paid, at the least calculation, twelve hundred dollars towards making that place of worship what it now is. Deacons HOWELL, GROVER, AND BROWN were the three strong men to whom I now refer. The time having arrived for the services, I tried to preach the dedication sermon. The Lord was pleased to give the dear brethren evidences of his approbation, and sanction the good work that they had done, by convicting sinners under the very first exercises of the meeting. It was thought best to continue our meetings a few days, and see what the result would be. The pastor, and some of the brethren and sisters, from Elmira, came up, and aided in the good work. God gave me strength to preach once or twice every day for six or eight weeks. It was a soul-refreshing season. Bro. Chandler baptized the converts, as pastor of the church in Elmira, for as yet no church was organized in connection with the house just dedicated. The church, I believe, was organized in May, and received recognition in July. After having labored through the protracted effort, Dea. Howell remarked to me that they were anxious I should take the pastorate. I had been acquainted with him for thirty years at least. He acknowledged that there were some drawbacks. The first was, aside from those, who had lifted so hard to build the house, the generality of the brotherhood were in rather limited circumstances. I conversed freely upon the subject, and yet see, in my mind’s eye, his tears, when he said, "I wish, Elder, we could give you what you ought to have, but I know we can not." I remarked to him, I never had had many trials or much trouble about salary business. Satan had sometimes tempted, to allure me from my chosen field of labor, and so had men, both orthodox heterodox, and also men professing no religion at all. One wealthy, enterprising man, said on one occasion, "Now, Eld. Sheardown, sell your horse, or give it away, and quit your preaching. You know as much about business as one-half of the merchants I am acquainted with. If you will, I will purchase you a stock of goods, and find you a place where you cannot help but get rich." I replied, "I had rather have nothing with a clear conscience, than be rich with a guilty conscience, having forsaken God, and the blessed vocation of preaching His Word for the sake of filthy lucre." I have wept and prayed a great many times with that man, sine the time referred to, around his own family altar. He sometimes would say, "Elder, don’t you remember when we talked about selling the old horse? I never should have made that statement, if I had known in my own heart the blessedness of the Gospel at that time." On another occasion, I received a letter from a friend in one of the cities, saying that their people were going to be destitute of a pastor, and were quite desirous of obtaining my labors. "Now, if you answer this by saying you will come, you may expect a call, very soon." I pondered this in my mind, looked over the long, hard years of labor and toil, on the mountains, through the valleys, and across the rivers, and it appeared to be time that I should look for a more easy field of labor. Riding alone one day, I almost decided that, all things considered, it was my duty to accept the call, if given. But I had no sooner come to the conclusion, than a voice came as from the Throne of God, "With Whom hast thou left these few sheep in the wilderness?" I had then on my hands two or three little churches, that were unprovided for. "With whom has thou left these few sheep in the wilderness?" I replied to myself (and perhaps audibly,) "Lord! I would not leave them in their present condition, for all the wealth they have in their city; nor has all their influence power to draw me there." There was another individual, with whom I was intimately acquainted—an excellent neighbor, kind in every sense of the word; I have baptized many in a beautiful little stream near his house, when his doors were always open to accommodate the candidates returning from the water; I have preached many sermons in his barn; he was always cheerful, and ready to accommodate--but, in his religious views, a Universalist. One day, in conversation with him, he referred to my straitened circumstances, and how difficult it must be for me to get along with my large family. "Now," said he, "I love to hear you preach, with some small exceptions. If you would only make a little change in your doctrine, come out on a full, free, and universal salvation, I can put you right into a good living, of at least six or eight hundred dollars a year." I replied, "God said, Buy the truth and sell it not." After having stated these facts to the deacon, he said, "Well, do you think you can live on four hundred dollars a year?" I answered, "Yes"—I had never had so large a salary, with the same hope of obtaining it, in my life; and that fact he knew almost as well as I did. The next obstacle that appeared to be in the way, was the difficulty in obtaining a house. "There is a little house," he said, "adjoining my farm, owned by Bro. Striker," but he would be ashamed for any stranger to come and visit his minister living in such an inconvenient place. I remarked to him, "It makes but very little difference to me what kind of a place I live in—I had just as soon live in a shanty by the wayside, as anywhere—if I could only say to my friends, I am only stopping here until such times as the church can build a parsonage." "That," he replied, "is what every church out to have, and I think we must try and do it." I then answered, "If you will make the effort to build a parsonage, we will be contented to move into the house you speak of." He replied, "It would be very difficult to obtain a site, for people do not like to sell off a small patch of their farms to put a house upon, because there would be always more or less uneasiness growing out of fowls trespassing, and other little things, for ‘tis the little things that make the great troubles. If you come with us, you must make up your mind to be on the lookout. There may be some little place for sale. And now, if you can be obtained under these circumstances, I will guarantee that every contract on the part of the church shall be fulfilled, to the very letter of it." Become a Settled Pastor I entered into an engagement with that new interest, to take the pastoral charge, and removed my wife and youngest son from Havana. I never saw her more happy in a removal than she was when settled on the plank-road, in the very bosom of friends who had known us so many years. And I must say it was equally satisfactory to me, after having been tossed about for so many years, to find that we were safely moored in such a quiet harbor. We looked forward for years of comfort, as well as toil, and, though an infirmity had got its hand upon us both, yet our motto remained the same, to die with our harness on. Neither of us thought, that in two short months, we should be severed from each other by the scythe of death, and become separated for all time. Mrs. Sheardown sickened about the last of June, and died on the 20th of July. (See Appendix) I felt, when I kneeled by her bed and prayed after she had breathed her last, as though I was cut loose from all my moorings. Our life had been a checkered one; but, however dark and gloomy everything around might be, we always had sunshine in our domestic circle. I have said but very little in relation to my wife. One reason as been, it is painful to me to review the past, because in that I view my severe loss. Not that I am not blessed in my present relations, nor that my second companion is not everything to me, now so late in the afternoon of life. We laid our beloved one away in the place of her choice, (Havanna,) near by the field where she had spent so many years of toil and labor in her domestic circle, in the church, and out of the church, around the sick bed, and every place, by day and by night, where her help, or any comfort, physical or spiritual, could be rendered. The burying ground in which she was laid, was disposed of by corporation order, and her remains, with the greater part of the others there interred, have been removed to a cemetery of some thirty-five acres, overlooking a beautiful landscape, where the Seneca lake can be seen, like a broad, silver belt, for near one half of its length. In my lonely condition, some of my children or grand-children were almost continually with me. One of my daughters let me have her own hired help to keep house for me, and myself and our youngest son were wrapped in the habiliments of mourning. After something like a year had passed away, I took my present companion, Mrs. Lorrin Alexander, widow of Amos R. Soper, of Pennsylvania. After this digression we will return to the parsonage. I met on the road, one day; a gentleman, who said to me, "Elder, did you know that Mr. Cook wished to sell his place?" I said, "No, sir." He replied, "I understand he does." I inquired if he knew what he would ask for it? He did not know, positively, but thought he would take six hundred dollars. It was one of the most beautiful building spots on all that plank road. I communicated the information to my good Deacon Howell. He remarked he would see, and ask John what he thought about it. This John was the junior deacon, the present Dea. Brown. He was not wealthy, but one of those whole-souled business men whose heart is like a globe, and as full of benevolence as the sun is full of light. They talked this matter up between themselves, and agreed to buy the place. The first thought was to repair the house that was upon it, or build an addition, but when they came to examine the house, after having made the purchase, they found that it had been built in those days when timber grew very large. It was put up in bents, with post and girders large enough for a barn a hundred feet long. It was thought best to abandon the old house entirely, and take it out of the way, dig a cellar, and put up a new house on the old site. Those two men prosecuted the work, paid all the contracts and bills, and when the last draw of the painter’s brush passed up the edifice, all was square, ready for the pastor to take possession of. For this house, with its two acres of ground, orchard and garden, I allowed them one hundred dollars a year rent. I labored untiringly to improve the ground, lay out the garden anew, fix up the door yard for a flower garden and shrubbery, (for I always loved flowers,) and endeavored to make everything as desirable as possible. There was a very nice, comfortable barn built upon the premises, so that there was little or nothing lacking to make it a beautiful home. Those deacons held the property in their own hands. This sometimes was a trouble to me, because I knew they designed to deed it to the church, through its trustees. It was very evident that Dea. 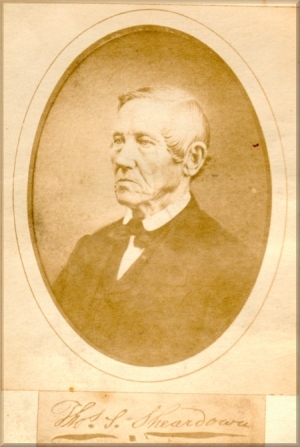 Howell, though not very aged, was failing. His dear companion—a woman in Israel, indeed, who yet survives—said to him, "David, you are very sick; had you not better make arrangements about that parsonage?" He replied, in his weakness, "O, yes—I wish John was here." Just about that time, Dea. Brown walked in, when the dying man said, "John, I am very sick. Ought we not to do something about that house and lot?" The young deacon said, "Yes, what do you wish to do, uncle David? "—"Why, you know I want to give my part to the church. Will you give yours? "—"To be sure," replied the junior. A professional brother from the First church in Elmira was at once obtained, and the business was finished. Those two men gave to the church a property which cost them from sixteen to seventeen hundred dollars. Bro. Howell was momentarily nearing the eternal world. At times, his pains were excruciating, but we knew that the blessings of God were buoying him up under all his affliction. After his death, his companion, for the benefit of science, gave her consent for a post mortem examination. I was present, and the fact was demonstrated that he died with cancer in the stomach. So passed away from life’s stage, one of the most upright, devoted, Christian men. As an officer in the church, he was always in his place, unless sickness or absence from home prevented. He was indeed the minister’s friend—the pastor’s companion. Very seldom did a week pass, but he visited the pastor’s house, inquiring if the family were well—if they needed any supplies—to talk about the interests of Zion, the great, important truths of the Gospel—then pray, and depart on other errands of good, or return to his avocation in life, or to his house to enjoy the comforts that could always be found around his happy board. Few infant churches have been blessed with such a worthy man, and fewer perhaps have been so suddenly deprived of his labors and influences. When the church was organized, it was expected that Dea. Grover also would cast in his lot with us, as we thought he could be more useful in this new location. To our great regret, he concluded to retain his standing with the old church in Elmira. He had contributed heavily towards the erection of our house, and lived convenient to it. His decision taught us that we must not put our trust in man. Dea. Brown had always leaned upon Dea. Howell’s wisdom and judgment in managing the affairs of Zion. But when the chief duties devolved upon him—often with fear and trembling, and with very diminutive views of himself—Dea. Brown bowed his neck to the yoke, and gave his shoulder to the burden, with a willing heart and ready hand. I recollect hearing a minister, while preaching before the Seneca Association, say that he had once in a while seen a minister indeed, but he had never seen a deacon. But I think I have seen as many deacons fill their office with credit to themselves and honor to the church, as I have of ministers. Things went on very pleasantly. We had an excellent Sabbath-school, through the summer season, of which Deacon Brown was superintendent. I have known few men better calculated to superintend a school than he is. And I have known him from his early years, for some of his family were converted under my administration, and joined the church in Caton. With that young church on the Plank Road, I spent many happy days, as well as days of grief. I used to go up into what was called "the Woods," to Deacon Brown’s saw-mill, and I don’t know but I preached as good sermons in that mill as I ever preached. We had an out-station at a school-house, pretty much surround by the native forest, where everything looked familiar and desirable. Another station was six miles down the river, about two and a half miles north of Wellsburg. God was pleased to give us, from time to time, evidences that we had not labored in vain nor spent our strength for naught. The query, perhaps, may arise in the minds of some, Why leave such a pleasant location? And here let me say, that I did not leave for want of a place in the affections of my people, neither because I had lost my attachment to them. In the first place, the field itself was contracted. Within the distance of six miles on that plank road, there were five meeting-houses, which spoke well for the people, at least in appearance. Yet, after all, considering the extent of the field, some of the ground was very sterile. But this was not the chief reason why I thought it duty to resign my charge. The church appeared to be bearing a burden, financially, that was too heavy for them. It wore upon my mind when I saw the desperate effort that they were willing to make to sustain their pastor, and especially the portion of it assumed by my beloved deacon. He was raising a family, his wife was in feeble health, his doctor bills and other expenses were high, and I noticed that if anything was done in a money point of view, the first inquiry was, "What has Dea. Brown done?" He must do the first, and that was not all; he must do the last also, for it appeared that he was "ordained to make up all deficiencies." I looked over some other little churches, which might be considered within reach of the pastor of that church, providing he was in the vigor of life, where the labor might be divided so as to have two charges, and he might be able, under God, to keep up both interests; and thus, two churches might comfortably sustain a pastor. This determined my mind relative to making a change. I never assigned the dear brethren all my reasons for declining to serve them longer, because I feared lest, peradventure, Dea. Brown might feel himself aggrieved, and, rather than I should resign, he would not only do what he had done, but perhaps more than his means would justify—for, if he had but one dollar, and he thought his pastor needed that—he would give it as freely as he ever breathed the air of heaven. I had learned that Bro. Mitchell, of Troy, Bradford county, Pennsylvania, was about to resign his charge, and desired to preach half his time in Columbia and Wells, and the other half with some other church that he could conveniently reach. I talked the thing up with my brethren, advised them to look at it and enter into an arrangement, (if it should appear to suit all around,) with Bro. Mitchell. I was considerably acquainted with him, and from the first esteemed him very much as a minister of Jesus Christ and a brother beloved in the Lord. They entered into negotiations with him, which resulted in his engaging to labor with them one-half of the time. This was a great relief to my mind. I feared their being left entirely destitute, lest they should become discouraged and should lose the vivacity and willingness to labor for God that they had manifested from their earliest existence as a church. Their ranks were liable to be thinned by removal and death, and they needed a pastor with a sympathizing heart, who could cheer and encourage them in the divine life. Bro. Mitchell removed into their parsonage, and commenced his labors. They were much united in him. Perhaps, I was acquainted with their views as much or more than any other individual. And all whom I ever heard speak on the subject, felt as though God in his providence had sent them the one best adapted to their circumstances. But he undertook to serve a third church, also, which proved too much for his strength, and he felt compelled to vacate that field. He now labors with the church in Springfield, Bradford county. The church in Troy were thus destitute of a pastor. I had made some acquaintance with the, while aiding Bro. Mitchell, two short terms, in extra religious efforts. I received a call to take the charge of that church. I accepted their invitation, and it was literally a change of pulpits and people between Bro. Mitchell and myself. I thought I knew something of the wants of the church, and inasmuch as it was getting late in life with me, I might there spend (God willing) a few more years in endeavoring to build up the waste places of Zion. In October, 1860, the dear brethren sent over their teams, and moved us to this place, where we now are. Our advent into troy was marked by one peculiarity, which was calculated to try our faith. We were successful in obtaining the house we now live in, (the property of Judge Wilber,) with the pledge that, if it suited us, we could have it as long as we wanted it. Though too far a distance from our house of worship to be really convenient, yet it has answered a very good purpose. One of my brethren’s house was next door to my own, on the bank of a branch of Sugar Creek. I had anticipated taking much comfort, for I thought I could run in at any time, ask counsel, exchange thoughts, lay plans for future usefulness, &c.
But God’s ways were not our ways. We had been about a week in our new domicile, and just got the things stowed away, our winter’s supply of vegetables in the cellar, and it began to look very much like "living." The brother and myself went down to East Troy, something over three miles. The day was remarkably rainy. On our return, in the edge of the evening, I asked the brother (Andrus Case) if he though the water would not be too high for us to pass through the Pond Road? He smiled and said, "O no, sir." Still, my mind was pretty well impressed that the creek must be very high, for I had considerable experience among the mountain streams of Pennsylvania, in Potter and Tioga counties. However, there was nothing to obstruct our way, and we arrived safe at home. Seeing the creek was rising fearfully fast, I went in and told Bro. Case it was getting rather wild. He replied, "There is no danger—the water wont hurt anything," and (if I am correct) he was so composed that he retired to bed pretty early in the evening. I did not feel like sleeping, but, watching the stream, found it was breaking over the bank by the corner of my barn, and assuming a very threatening aspect. The wrecks of bridges, buildings, and so on, began to come down, quite rapidly—the night, impervious darkness—my garden, under water some two feet—my cellar, full. Very soon, the kitchen part of Bro. Case’s house went down stream. That began to stir my feelings. Next, his dining room sailed away, (Those two parts appear to have been added after the main body of the house was built.) People were out with their lanterns, wading in the water in every direction except near the stream. They all felt confident that the water had done its last work as it regarded Bro. Case, and that the main body of the house was so permanently fixed that it could not go off. However, such was the amount of drift-wood lodging against the dam, that at length, as with one fell swoop, the flood broke through, carried away the bulk-head on our side of the stream, swept his beautiful dwelling, with all its contents, into the surging mass, and—as he had on the banks of the creek—his barn, well stored with winter supplies on a lot he owned on the other side of the stream, a little below, was taken bodily with all its contents, and much of the lot itself was washed away. So the Lord in his providence took from our beloved brother, as with a stroke, the greater part of his hard earnings. It was a heavy blow. We felt intensely for him. But God has been please to abundantly bless him, and we think he may say with Job, that he has now more after the affliction, than he had at the beginning. Having survived the flood, I was next ready to look out upon the land that I was designing to labor in. And first I would say, in relation to Troy itself, that I was as much disappointed, in its business capacity, as I was in the appearance of New Town, to which I have been referred. In all the villages in which I have been, I think I never saw one, of the same population, carrying on the same amount of business that is done in Troy. There is nothing between Elmira on the North and Williamsport on the South, and I knew of nothing East or West within at least twenty miles, that can be called a business town like it. It is to me always cheering to see active men, with their hands full of employment. Before commencing my experience with the Troy church, I am wondering what has become of the church in Millport, and also that at Lindley and Lawrenceville! They used to have their place with the churches composing the Chemung River Association, but of late years we do not see them. Both have been subject to fainting away, every once in a while, but I have never heard either of them had entirely given up the ghost. For some time, I have doubted the ability of the brethren in Millport, to retain their visibility. Their location is not the best. Yet I have hoped that the interest in that place might live, providing the strong and wealthy church at the Horse-Heads would throw their arm around it, so that they might remain as a branch church if no more. But I see no reason why the Lindley and Lawrenceville church should be in its present condition. Its location is good, with a community from which should be gathered a Baptist church of some strength. It was organized in 1841. I well remember its recognition, when our venerable father, Alfred Bennett, preached from that memorable text, "The Church of the living God, the pillar and ground of the truth." They appeared to commence under favorable auspices—have had several pastors—and for some years kept up their meetings regularly. In relation to them, (as also to several other small churches on the southern tier of towns in New York, and the northern tier in Pennsylvania.) I have thought that the great failing has been the want of adaptation in their pastors to the work on which they have entered. They may all have been good men. But it demands peculiar talents for gathering churches. And to build up under such circumstances, requires missionary habits of life, unshaken confidence in God, indomitable perseverance, and good common sense. Moreover, I have often feared that many pastors cripple their own energy by doubting and fearing lest peradventure they may not be sustained. I know no other way but for a preacher to do his full duty and trust in God. I may be permitted to testify on this subject, because, in all the ministerial labor that I have done, and the churches which under God I have been enable to build up, I never had anything from a convention or missionary fund, save in Jefferson and Hornellsville. And we can erect our Ebenezer to-day and say, Hitherto hath the Lord helped us! And now a few words in relation to the church over which God has permitted me to preside for fours years past. First I would say, I have not accomplished all that I hoped to do, but I can truly add that I have done what I could. I have not kept back anything that I thought was for the glory of God and the best interests of Zion. I have tried to give my hearers the cream of my long experience and observation. I have thought as intensely, perhaps, as I have ever done, to bring forth things both new and old. In sickness and in health, I have received from them nothing but kindness and attention. I have some as choice brethren and sisters as can be found anywhere. They have my affections—they live in my heart and in my prayers. But, as a church, we are not what we wish we were. Perhaps the principal lack is that of MORE ARDENT PIETY—more love and affection for each other—more the appearance of a unity of brotherhood, as one common family. Not that I am disappointed in coming here. Many years ago, I learned that the great want of the church generally, in these latter days, is a strict discipline, and more thorough teaching in the doctrines of the Gospel of Christ. We need to master the great fundamental truths of religion—vivid perceptions of the deep things of God, as revealed unto us in the New Testament—to see more clearly the necessity of divine sovereignty and human agency going hand in hand—with a good understanding of our peculiar views as Baptist—carrying out in our lives the Gospel we profess—and walking up to our covenant obligations with God and one another. No doubt we are often weak when we might be strong, were we better acquainted with God’s claims upon us. And we can only attain to this by a growing knowledge of the will of God concerning us, as revealed in the volume of divine inspiration. It appears to me that there is among the body of Christians a fearful lack in this one thing—we know by far too little of the Bible. One great cause of this, is because we read almost everything but that "Book of Books." We hear in every church, in prayer circles, in conference meetings, in religious conversations, but very few quotations from the sacred Word—and many professed quotations from the Bible are made up from some other book, of something we have heard or formed in our own minds, and taken it for granted that the Bible says so! When I hear such mis-quotations, it reminds me of a certain Baptist minister, who, when he arrived at the place of his appointment, (which was in a school-house) found that he had left his pocket Bible at home, and there was no Bible present. He said, very confidentially, "It makes no difference, friends; I shan’t take a text that you wont find between the lids of the Bible. It is certainly there, though I can not give you the chapter and verse. Now my text is, ‘Stripped for the race and harnessed for the battle.’" After the services were over, a Presbyterian deacon said to him, "Elder D., your sermon did very well. I have no fault to find with it. But your text is not in the Bible." The minister replied, rather short, "Yes, sir, it is in the Bible. "—"Well, my brother," replied the deacon, "if you will find it, come to me, put your finger upon it, and let me read it, I will give you my horse and buggy for the information." The minister searched diligently, by the help of his Concordance, but could find no "Stripped for the race and harnessed for the Battle." The deacon saw him some time after, and said, "Why didn’t you come for my horse and buggy? "—"Why," he confessed, "I could not find the text. "—"Do you know the reason, sir? "—"I suppose," replied the minister, "it is not there." There was a preacher who was too little acquainted with his Bible, and here was a deacon, trembling upon the borders of the grave, with his mind so stored with God’s Word that he knew assuredly the words the preacher used for his text were not in that sacred volume. And here is the great difficulty with us at the present day. We do not read and treasure up in our hearts and in our memories, as our fathers did, the blessed promises of God’s Word, the glorious truths of divine revelation. O, that we would make a simultaneous start as Christians, and in this respect return to the good old paths of those who have gone before us! I feel happy in my relation with my brethren here. I have always been conscious that the churches here had to bear more with me, than I had to bear with them; and the only difference is, that the members have to bear with the failings of one, while the pastor has to bear with the failings of many. And I am very much indebted to this community. I have never found more friends, outside of my church, than I have found in Troy. As far as I am concerned, I do not think their equals can be found—unconverted people, and people of other denominations, give decided evidence that their friendship is of a genuine cast.